The elegantly re-imagined ancient bathhouse and the friendly service leaves us lingering here long after we complete our meal. In the bustling metropolis of Iran's capital city of Tehran, one afternoon TV show still manages to draw thousands of viewers, even after nearly two decades. Bahooneh - or "an excuse" in Farsi - is the nation's longest running cooking show, hosted by Iran's first male Chef, the 45-year-old Saman Golriz. Spending a day with the vivacious chef inevitably involves site visits to Tehran's best eateries, frequent stops at ancient architectural sites in Tehran's old - pre-revolution - streets, and of course photo-ops with his growing fan base who, in spite of his disguise of baseball cap and sun glasses, manage to spot him. Our bumpy, fast-paced taxi ride spits us out at the old shopping district of Tehran - the bustling financial stronghold of antique dealers predominantly owned by Iran's Jewish merchants. It's delightful to see that the thriving Jewish community of Tehran has not lost its pre-revolution stronghold on the financial, carpet and antiques industry here. Rushing through the bustling streets of Manuchehri, in central Tehran, flanked by Ferdowsi and Saadi streets - named after renowned 7th and 13th century Persian poets respectively - endless lines of antique shops showcase estate jewels, antique ceramics, pottery, sculptures and retro collectables catering to eager shoppers practicing the fine art of bargaining - which seems to be a national sport. 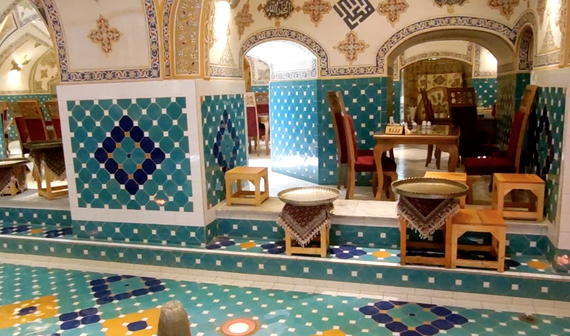 On Saadi Street, we stop at Khoshbeen Restaurant - famed for its authentic, northern cuisine. Iran's 31 provinces pride themselves with their own distinct climates, cuisines, dialects and cultural traditions. Opened 30 years ago by Mr. Navidi, the restaurant is now run by his three sons and caters to a long line of regular lunch-time diners. Moving charismatically down the line, Golriz greets the owners with typical Persian formalities and soon we are led to an emptying table in the packed restaurant where Golriz orders a few dishes without reviewing the menu. The waiter disappears into the small kitchen at the end of the one-room restaurant to reemerge with: Chicken and Beef Kebab Toursh marinated in pomegranate juice and crushed walnuts and aromatic herbs, followed by fried fish delivered that morning from the northern shores. The kebabs melt in our mouth, tantalizing our pallet with a fine balance of tangy pomegranate and savory taste of the finely barbequed meat. The side dish of Baghali Ghatough stew, made with lima beans, Mirza Ghassmi eggplant, tomatoes, onion, eggs, dill and garlic juice combined into a perfect paste alongside traditional marinated olives add more color and distinct taste to our small feast. Our next stop is Nayeb Restaurant on Vozara Street. The story has it that in 1875, the grand Nayeb-Gholamhossein and his family bought a public bath and designated a section for businessmen to enjoy a buttery rice and a kabab dish -- the Chelo (rice)-kabab, which has since become the traditional national Persian dish. Today, the high-end, elegant restaurant - housed in basement level where white cloth covered tables are accentuated with Persian antiques, cast iron motifs - caters to a non-stop flow of diners. At the "reception" desk, women in headscarves process bills as a large crowd surrounding a large marble bust of the grand Nayeb await for their tables. Golriz quickly moves through the long line, greets the owner and soon we are rushed to a table. Our entry creates an obvious stir as fans of the show spot the chef. And once again Golriz spares no time to order the house specialty - Chelo Kabab. The dish most fervently claims its ancient fame and place at top of the best-regarded Persian dishes: the meat is moist, juicy, aromatic, and a perfect accent to the buttery saffron rice accented with Tah-Chin, a savory, saffron rice-cake. The experience is nothing short of exquisite. 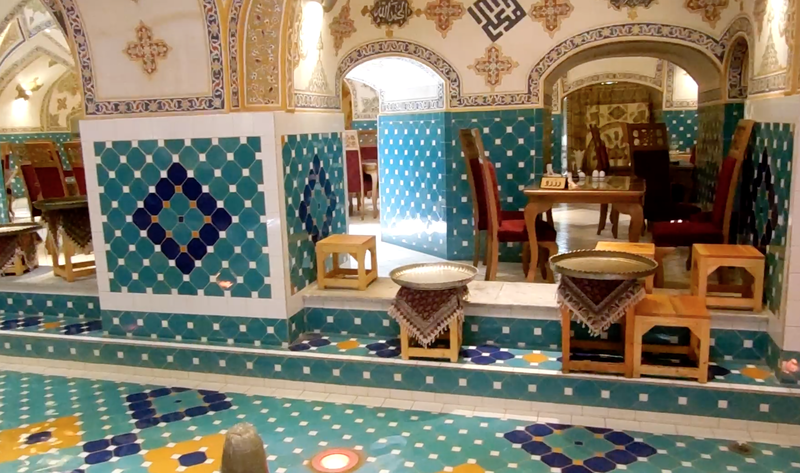 As we leave Tehran for a 340-km journey south to visit UNESCO registered historic sites of Isfahan, we are determined to find Golriz's recommended Jarchibashi bath-house restaurant, one of the oldest bathhouses dating to the Safavid era in Isfahan. From an unassuming dirt alleyway off a side street near the UNESCO-registered site of Naghshe-e-Jahan (Map of the world) Square, we find a humble arched entryway to the restaurant. Inside, hand-painted crisscrossed archways hug private dining nooks adorned with elongated rectangular, blue-tiled shallow pools with gurgling fountains that soothe away weary travelers' fatigue. Every nook of the restaurant is masterfully restored and colorfully painted by local artisans. With a capacity to hold 300 guests, the restaurant's waiters greet us with mobile ordering gadgets as they review the bi-lingual (English and Farsi) menu placed at each table where digital gadget allow diners to request various items with a push of a button. Restaurant owner Haj Sayed Ahmad Eftekhari who spearheaded the nine-year, $400,000, massive restoration of the dilapidated bathhouse - welcomes us to the restaurant now inaugurated as a historical, national monument. Copper trays and samovars, handcrafted here in Isfahan by local artisans, adorn every corner of the restaurant. Square, boxed grills with perched teapots offer aromatic, perfectly brewed tea - as diners are showered with sunlight streaming from perforated domed roofs of the renovated bathhouse. We quench our thirst with a large glass of ice-cold Dough, a drink of yogurt and herbs, as our Entre' of Baghali Polo - lima bean rice with dill and chicken emits an intoxicating aroma of dill and saffron. The tender chicken meat roasted with the rice and dill offers a crispy Tahdig bread flipped upside down on a plate. The mouthwatering blend of the local cuisine, the elegantly re-imagined ancient bathhouse and the friendly service leaves us lingering here long after we complete our meal. Back at Isfahan's grand plaza, we review Golriz's recently released cookbook - Back Streets and Alleyways of Cooking - as a great companion to discovering authentic Persian dishes throughout this vast land. Watch segments of Golriz's Bahooneh show on YouTube. Try his unique recipes. Make sure you translate the site from Farsi to English. And as they say in Farsi, Nooshe jan - Bon Appetit.